What makes a Smartphone “Smart”? It’s amazing how far cellphones have come. Traditional mobile phones supported only general functions like making calls, sending texts and playing basic multimedia files. But today, the average smartphone is equipped with powerful hardware and advanced software packages that allow it to run complex applications, which were previously supported only by PDAs or desktops. There are several ways to look at what makes a smartphone “smart” but the fundamental attribute behind the brains of these devices is the clever combination of useful hardware and software into a package that’s small and portable. The most apparent difference among smartphones is the size, and it’s typically determined by the size of the screen. When smartphones first hit the shelves, we had few choices of measurements. Early smartphones came with physical keyboards but, over time, manufacturers embraced touchscreen technology, which allowed them to pack bigger screens on the same phone-size. Now, you can find pretty much any phone you want; big, standard or small. Going by modern day standards, a phone with a screen smaller than 4 inches is considered small-sized, anything between 4 and 5.5 inches is standard size, and if you go beyond the 5.5-inch mark, you’ll be in the big phone (phablet) territory. This is the heart of any smartphone. It’s the OS that determines a phone’s user interface and software features. Popular smartphone operating systems include Google’s Android, Apple’s iOS, and Microsoft Windows Phone OS. All these platforms have come a long way. The latest versions have highly intuitive touchscreen interfaces and a bevy of features that maximize a smartphone’s functionality. A smartphone, like any regular cell phone, can make calls and send texts. Thanks to sufficient storage space, the number of texts and phone numbers a phone can store is virtually limitless. Furthermore, smartphones are designed to automatically take note of the people you contact the most, and have those numbers at the top of the phonebook for fast and easy retrieval. You can also set up customized ringtones and voicemail messages, forward incoming phone calls to other numbers and back up your contacts on online cloud spaces like Google Drive and iCloud. In response to the advancement of mobile communication, smartphone cellular connectivity has made significant strides over the years. Many high-end devices now have 4G capabilities for faster and more reliable mobile broadband internet. Additionally, nearly all smartphones support Wi-Fi connectivity, with which you can get onto the internet or a local network whenever you’re near a hotspot. Users can expand the functionality of their smartphones by installing useful applications from the app market. The type of operating system determines the quality and quantity of the apps available for a device. In Google’s Play Store and Apple’s App Store, for instance, you can find lots of free apps as well as premium apps that can be purchased for as little as one or two dollars. Nowadays apps help people manage their daily schedule, get social media updates, monitor daily calorie intake, locate pizza places nearby, keep track of finances, get weather updates and more. Contact apps can backup and sync your contacts to your Gmail or iCloud account, and there are security features that can help locate your lost phone or wipe all of its contents remotely. You can even get educational and learning apps that will deliver information to your fingertips, wherever you are. Remember when you used to play 3D symbian or java games on your cellphones? The latest smartphones have HD screens,powerful processors and GPUs to support games that look almost as good as desktop games. Asphalt, N.O.V.A, Modern Combat and Shadowgun are some of the popular high-end mobile games in the market today. Smartphones are evolving into serious gaming machines competing with the latest handheld consoles in the market. Older mobile devices did support many multimedia file formats but due to poor screen quality, limited storage and processing power, running high quality audio and video was not possible. The latest high-end Smartphones have full-HD resolution displays, large storage up to 64GB and quad-core processors to let people enjoy 1080p videos. But the fun doesn’t stop there. Modern handsets come with both rear and front-facing cameras, whose advanced sensors allow users to take high-quality pictures and make crystal-clear videos easily. Just like the keys on computer keyboards, the keys on a smartphones are laid out in the QWERTY format. Compared to many traditional cellphones where you’d have to tap a single key to enter different characters, the new smartphone key arrangement saves a great deal of time while sending texts, emails or taking notes. Smartphones are undoubtedly sophisticated. Primarily, however, they’re electronic devices and, therefore, need a constant supply of power to stay up. As phones have grown in both size and power, so have their batteries. A high-end smartphone’s battery should be big enough to satisfy the power-hungry HD screen and multi-core processor. Also, care should always be taken when charging a smartphone. For safety, experts advise only using a charger that’s supplied or specified by the manufacturer. Smartphones come in many shapes and sizes, but they all work towards offering the features above, in the best way they can. 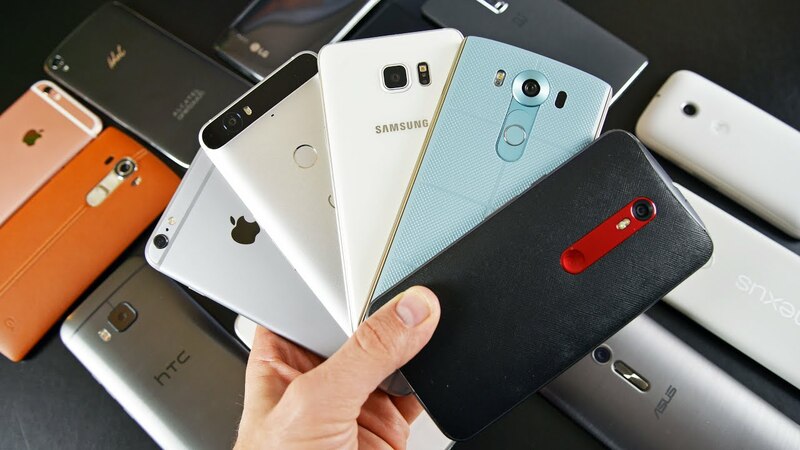 Types of Smartphones – Smartphone types explained based on different categories.